Finally blogger has launched its read more function in post editor over which the blogger team was working from few months as it was the most demanded feature by all the bloggers.And its just easy to add it in your blog posts while writing.Just keep writing the post in your editor as you do and just insert jumpbrek into it i.e read more function by hitting jumbbreak button provided by updated post editor in blogger or editor in draft.blogger or just go to settings tab >> Select post editor and use update editor to use new features of it. Really this updated editor too has been loaded with many features,if you not using it just sart using it for sure.And on how exactly to use this read more function in blogger posts given by blogger you can visit post by bloggerindraft blog which is explained very clearly. I've got a problem with my 'Read More' link. When I use the one supplied by Blogger the article will cut off on the front page as usual, but there is no 'Read More' link to be found. Can you see anything there that might be causing the problem, or should I send you on the Template? I have tried using it yesterday itself. 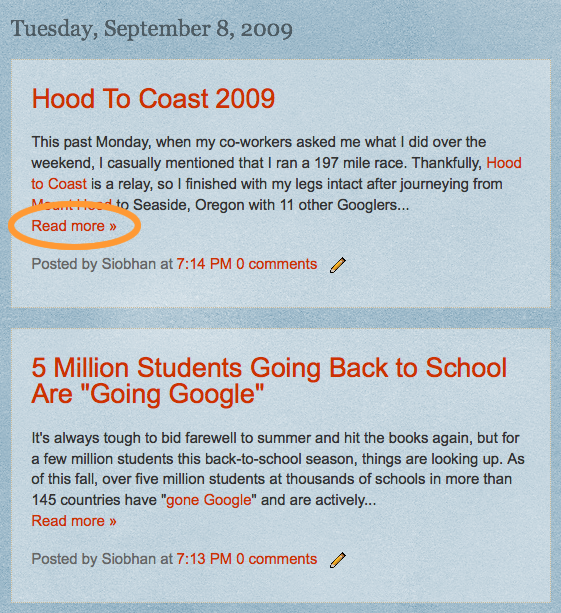 But the 'read more' text will not be displayed on the post when you view blog..Also,the text after the 'read more' will not be displayed. I had started a topic regarding this on blogger forum and many people replied back saying,they too experience this issue. For more details,see this thread of discussion..
@ above comments you all can read this tutorial by amanda to solve your problems you are facing.